As I did last time, I’m changing the look of the site somewhat for Conference. The homepage, TempleStudy.com, will become the Conference page. I’m “dimming the lights” so that the streaming video is easier to watch. 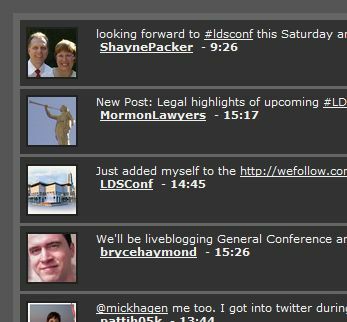 Below the video you’ll find the same auto-updating Twitter feed following comments about Conference using the #ldsconf hashtag. I’m looking forward to hearing the Lord’s prophet and apostles speak this weekend. Let me know if this mashup is helpful to you, or if there’s anything you’d suggest.